Wicklow’s scenery is the stuff of legend and among the best Ireland has to offer. Glenmacnass waterfall and the Guinness estate at Lough Tay are particular highlights. The Dublin Mountains merely hints at the wild and epic country that lies just beyond their modest peaks. County Wicklow is a land shrouded in mystery and drama, a vast and at times uninviting landscape that hides havens of rare beauty in its dark woods and wild bleak moors. It is a primordial place, exposed to the harshest of elements, where howling winds can transform the landscape from that of a haunting Celtic Twilight to the gothic imaginings of Edgar Allen Poe in a matter of moments. Raw, gnarled and rugged, Wicklow can be an intimidating place to venture, but it also just happens to be probably the most fantastic place in Ireland to take a bicycle. 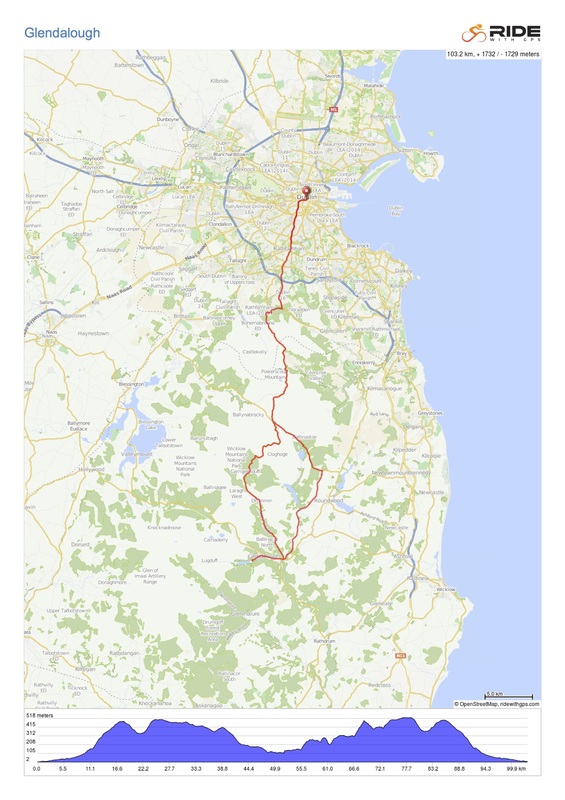 Heading out of the city, the route is a very gradual ascent until Rockbrook, where the gradient begins to become more challenging, winding over the Dublin Mountains, and entering Wicklow County. The road levels out above Glencree, where the views can be quite magnificent. If you look up, you will probably see the serpentine coils of the infamous Sally Gap road. It was here that a young Stephen Roche cut his teeth, before going on conquer the world of cycling in 1987. 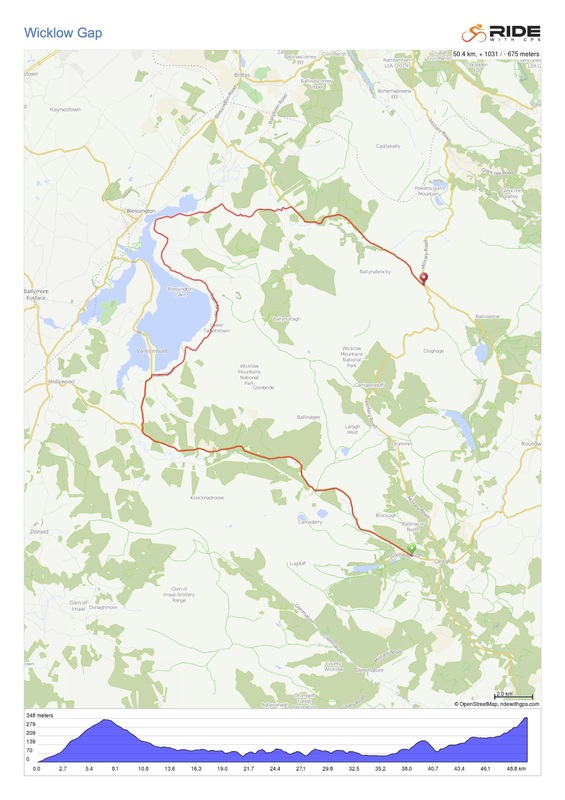 Needless to say, the Sally Gap is a challenge, and is road that often separates Irelands recreational cyclist from the enthusiast. Take a breather near the top if you need it, as the view behind over a previously hidden lake is a fine way to settle a troubled heart rate. 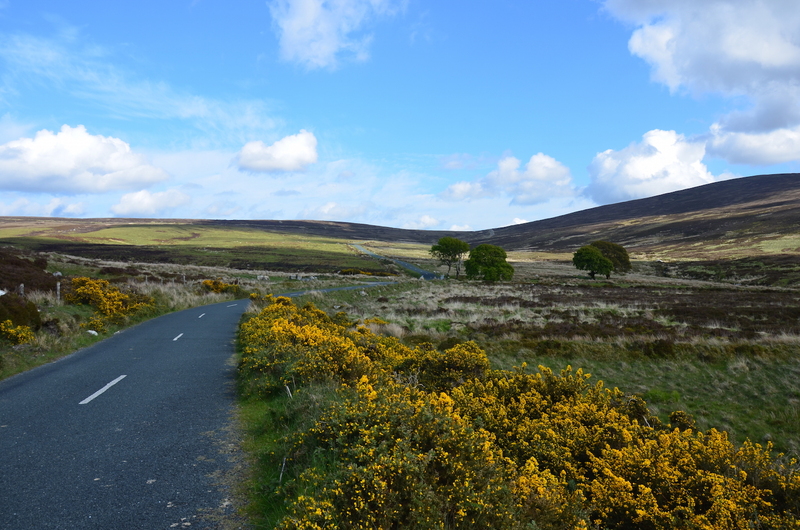 Once over the top, take comfort in knowing that the worst is behind you, and on taking the Glendalough road at the lonely cross roads ahead awaits an exciting rolling moorland which seems to reveal increasingly beautiful views beyond each sinewing turn of the road. It is also worth noting that the looming mountain to your right, is Kippure, source of the river Liffey, little more than a trickling brook at this point where it commences its 160km meander towards the Irish Sea. Even if you’re familiar with this route, Glenmacnass waterfall often appears unexpectedly from behind a woodland on a particularly fast section of the road, and if you’ve brought a camera, it is an unforgettable sight. A speedy descent beyond will bring you to the village of Larragh, and the Glendalough Green Cafe which is a firm watering hole for cyclists. If there is a single place in Ireland that can expresses the very soul of the nation, it is surely Glendalough. A sublimely beautiful sheltered valley was home to one of the earliest monastic settlements in Ireland, where hidden and protected from the rampaging Norsemen, the monks turned their attention to a particularly ascetic and insular communication with God. A stroll through the ruins of Glendalough and on to the Upper lake could easily prove the highlight of any trip to Ireland, and is entirely unmissable. Returning to Dublin is more direct to follow the main road through Roundstone, but heavy traffic can sap the enjoyment of the route, so a lesser known road can be found by taking the first left on leaving the village, where there is a sign directing a hostel. Seldom are any vehicles encountered on this road, as you pass through a particularly tranquil part of the county. A sign for the Sally Gap will be encountered eventually, and although the bad news is that the Gap must be climbed once more, albeit a slightly gentler ascent, the views of the private Guinness estate of lough Tay you will soon pass through make up for any trepidation. The crossroads on Sally Gap will eventually crawl into view, and on taking the turn for Dublin and almost the final straight, it is worth checking your brakes before the white knuckle ride of the descent back to Glencree, containing one particular bend that may make you feel as though you’ve cycled onto a sky slope. Glendalough is absolutely unmissable. A whole day could easily be spent here, but at least a half hour break to see the tower is highly recommended. The village of Laragh has several places to eat and drink, but the Glendalough Green Cafe at the entrance to the village has the most charm. 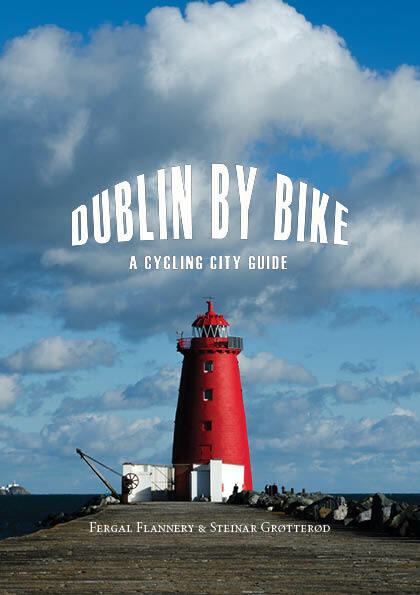 A landmark for cyclists, you will generally see a gathering of bikes outside on any given day. Wicklow’s scenery is the stuff of legend and among the best Ireland has to offer. Glenmacnass waterfall and the Guinness estate at Lough Tay are particular highlights. The landscape of Wicklow rewards repeat visits as the light and the elements can change so dramatically in the space of an hour, never mind a season, rendering a familiar view strange and mysterious once more. Though not for the faint hearted, the Wicklow Gap and Blessington Lakes offer a splendid alternative route to return to the Sally Gap cross roads, before descending the mountains to Dublin. The Wicklow Gap is probably one of the most challenging stretches of road in the whole country, climbing steadily for 10 kilometres from Glendalough towards a hydroelectric power station. Although the gradient is never terribly high(<10%), the climb is both unrelentingly and greatly exposed to the elements. It is made all the more intimidating as most of the roads incline is visible whilst you creep your way along it. There is a great sense of achievement when the summit is reached as the views are quite remarkable. An accomplished cyclist might be interested to compare their time over the Gap to those of the Tour De France peloton, who hurtled up this this road at slightly suspicious speeds in 1998. After the exciting descent of the Wicklow Gap, a beautiful rolling countryside is encountered before the Blessington lakes appear. (Look out for the signposted turn to Vartry) The lakes were artificially flooded to become a reservoir for Dublin, and on rare occasions of low water levels, the eery remains of stone houses can be glimpsed protruding from the water. The lakes are a particularly beautiful and peaceful area, with the village of Laken being a real highlight. The route turns back towards the Sally Gap with another considerable climb along the banks of the river Liffey, little more than a shallow brook at this early stage in its course, finally returning to the cross road and rejoining the original route.